Large spacious rooms with balconies overlooking the river, super comfortable beds, pleasant public rooms with a good cafe and wonderful thermal spa facilities. Expect to have to see a "doctor" but, fret not, this just involves sitting down with a sales person who gives you prices and schedules your treatments. The best priced package includes breakfast and one 30-minute daily thermal water plunge. Also, recommend eating lunch and/or dinner at the facility since the local restaurant alternatives are not great. You can book additional meals when you arrive at the hotel. Highly recommend booking the Halotherapy treatment which involves inhaling the steam vapor coming straight out of the hill behind the spa. La limpieza, el personal, muy simpático, atento y la tranquilidad. La sauna natural es impresionante,es lo que más me gustó y el trato de la gente que trabaja allí fenomenal. Le parking, la piscine chauffee, des lits confortables, la propreté de la chambre, le bacon. Balneario de Fitero - Hotel Bécquer This rating is a reflection of how the property compares to the industry standard when it comes to price, facilities and services available. It's based on a self-evaluation by the property. Use this rating to help choose your stay! Balneario de Fitero is located in a landscape featuring natural thermal baths dating from the Roman era, a perfect place to enjoy nature and good health. Guests have free access to the all-year-round outdoor hydrothermal pool. 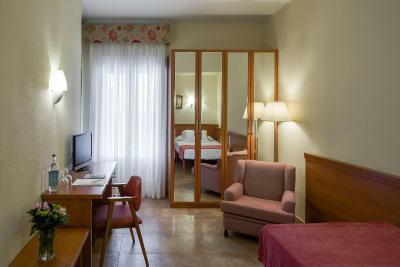 The air-conditioned rooms at Balneario de Fitero have a safe, a sofa, and a flat-screen TV. The bathroom comes with a bathrobe, bath or a shower, and hairdryer. The complex features well-maintained facilities surrounded by gardens, terraces and a thermal swimming pool. There are a wealth of therapeutic treatments on offer that guarantee your absolute rest and relaxation, as well as a full social and cultural activity program and sporting facilities. This is a new concept in accommodations, which uses leisure and its closeness to nature in order to promote health and wellbeing. It is located in the rough, wild, volcanic landscapes of the south of Navarra. The complex is located 1.9 mi from Villa de Fitero. When would you like to stay at Balneario de Fitero - Hotel Bécquer? This air-conditioned twin/double room features flat-screen TV and sofa. The private bathroom offers a hairdryer and bathrobe. Guests have free access to the outdoor thermal pool. This room includes 1 30-minutes water circuit per person per stay. This single room has a balcony, air conditioning and sofa. House Rules Balneario de Fitero - Hotel Bécquer takes special requests – add in the next step! Balneario de Fitero - Hotel Bécquer accepts these cards and reserves the right to temporarily hold an amount prior to arrival. The thermal pool temperature is 34ºC. First of all, be prepared for an older style spa facility accommodating large numbers of Spanish pensioners who have been going there for many years and simply love it. There is a kind of institutional feeling about the place. If you are driving, the free parking lot is a long walk from the hotel, and the cool water swimming pool is across the street which is somewhat awkward. If you can get over these items, you will enjoy your stay. I don't recommend this property for families with small children.